Old Georgian Bolshevik; helped organise the Stalin faction, was later put in charge of heavy industry. Although he remained a faithful Stalinist, the circumstances surrounding his death are not known. Sergo Ordzhonikidze, the son of a small landowner, was born in 1886. He became a student at the Mikhailov Hospital Medical School in Tiflis where he became involved in radical politics. In 1903 Ordzhonikidze joined the Social Democratic Party and supported the Bolshevik faction. Soon after graduating as a doctor, Ordzhonikidze was arrested for conveying arms. He was released and decided to live in Germany. 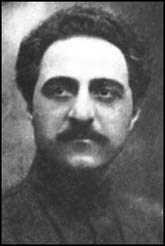 Ordzhonikidze returned to Russia in 1907 and settled in Baku, where he worked with Joseph Stalin and Stepan Shaumyan. In October, 1907, he was arrested for being a member of the Social Democratic Party and deported to Siberia. Three years later he escaped and went to live in Paris. In April, 1912, Ordzhonikidze and Joseph Stalin returned to St Petersburg. Ordzhonikidze was soon captured and sentenced to three years' hard labour. After the February Revolution Ordzhonikidze joined with other Bolsheviks to gain control of Yakutsk. In June he arrived in Petrograd where he joined his long-time friend Joseph Stalin. During the Civil War Ordzhonikidze became Commissar for the Ukraine. He was involved in fighting at Tsaritsyn and the Caucasus. In 1920 he helped establish Soviet power in Armenia and Georgia. In November, 1926, Stalin appointed Ordzhonikidze to the presidency of the Central Control Commission where he was given responsibility for expelling the Left Opposition from the Communist Party. Ordzhonikidze was rewarded by being appointed to the Politburo in 1926 and later became Commissar for Heavy Industry. However, in 1936 Stalin began to question Ordzhonikidze's loyalty. Stalin was particularly upset when he discovered that Ordzhonikidze was using his influence to protect party members such as G. L. Piatakov who were being investigated by the NKVD. Rumours began to circulate that Ordzhonikidze planned to denounce Stalin before the Central Committee Plenum in February, 1937. It was therefore not surprising that Ordzhonikidze was found dead before he could make his speech. The death certificate, signed by Dr. Kaminsky, the Commissar for Health, claimed that had committed suicide. Kaminsky was himself arrested soon afterwards and executed. Sergo Ordzhonikidze's youngest brother Konstantin arrived at the Kremlin soon after his body had been found. When my wife and I reached the second floor, we went to the dining room, but were stopped at the door by the NKVD agent. Then we were let into Sergo's office, where I saw Gvakhariia. "Our Sergo is no more," he said. I ran to the bedroom but my way was barred, and I was not allowed to see the body. Then Stalin, Molotov, and Zhdanov arrived. Sergo's secretary, Makhover, uttered words that stick in my memory: "They killed him, the rats". Well-known caricaturist and cartoonist (by the pseudonym Moor)who was employed by the State Publishing House. In 1920 he did posters for the Red Army and was a regular cartoonist for Pravda. British dystopian novelist and democratic socialist. Eric Blair was born in 1903 in India, a child of that section of the British middle class who staffed the sprawling outposts of the British Empire, then at the height of its power. Sent back to England to be educated at the elite public school Eton, the young Blair initially looked set to follow in his father’s footsteps, and in 1922 joined up with the Indian Imperial Police stationed in Burma. However, the young Blair had already developed a healthy suspicion of the ruling class and illegitimate authority while at Eton, and after five years of work assisting in what he later called ‘tyranny and exploitation’ in Burma, returned to Britain a convinced anti-Imperialist. Amid the Great Depression, ‘George Orwell’ the novelist was born, making his mark with documentary accounts of the poverty and suffering of working class people such as Down and Out in Paris and London (1933) and The Road to Wigan Pier (1937). While he briefly joined the Independent Labour Party, took Trotskyism and anarchism seriously, and always longed for a revolution in Britain, the literary anti-Stalinist classics Animal Farm and 1984, which made his name, were marked by a profound pessimism. While always a contradictory and unpredictable writer, his early death in 1950 sadly robbed Orwell of the chance to put up a better fight than he had done up to that point against the numerous reactionary apologists for the rich and powerful, who were trying, as they still try today, to claim him as one of their own.